The Strawberry Blueberry Cupcake is the most divine, richest and most flavorful cupcakes I've ever made! 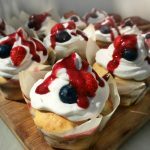 It's seasonal, pure spring with blueberries and home grown strawberries, topped with whipped cream and strawberry blueberry sauce! Beat the egg whites with the half of the sugar and the whole eggs with the other half of the sugar. Add the milk, the sour cream and the coconut oil to the beaten whole eggs. Add the flour, the baking powder, the baking soda and the pinch of salt too. Zest the lemon and add it with vanilla to the rest of the ingredients. Bake it on medium heat for 20 mins. For the sauce, pour the berries and sugar to a saucepan and cook it with constant stirring on low-heat. When the sauce thickened, strain through a sieve. Get the cupcakes out of the oven, let it cool for about 5 minutes. Meanwhile, whip the whipping cream. Top the cupcakes with the whipped cream, drizzle some sauce on them, then add a blueberry and a quarter strawberry.